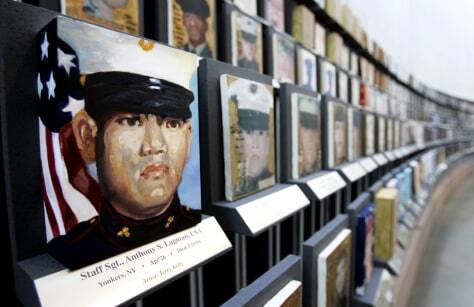 Paintings for the exhibit "Faces of the Fallen; America's Artists Honor America's Heroes" are seen Tuesday at Arlington National Cemetery in Arlington, Va. The exhibit features more than 1,300 portraits of soldiers killed in the Afghanistan and Iraq wars. The art will be on display until Sept. 5.